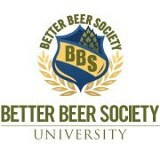 Rob, Jake & the folks behind Better Beer Society have announced enrollment for the upcoming spring semester of BBSU (Better Beer Society University). Campus will once again be located at Republic (West Bank location). This semester they have added an additional class to meet demand. Beer education will occur in of form of two sessions (first session is at 6pm, second session is at 7:30p). Both will be one-hour long courses. Your tuition costs will go to education on all aspects of the beer industry (breweries, retail, hop farming, distribution, maltsters, and so forth). BBSU will also teach you how to explore your palate, cook w/ beer and create pairings. Tuition cost for BBSU spring semester will be $75 (which equates to $6 / class, or roughly the cost of a beer). New students are encouraged to enroll early for their preferred time slot, as space is extremely limited, and last semester sold out very quickly. For more info checkout Better Beer Society online.